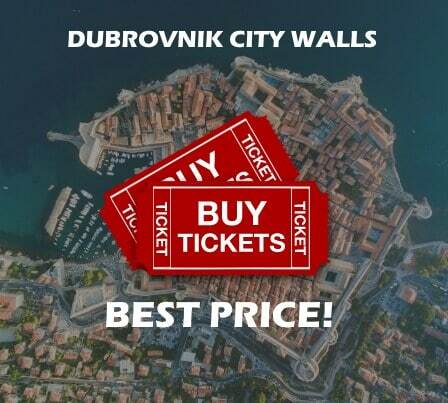 In the period of droughts the ships were known to carry the fresh water from the spring in Mlini in Župa dubrovačka and sell it in the Dubrovnik port to private consumers or the water would be used to fill the dried up public wells. 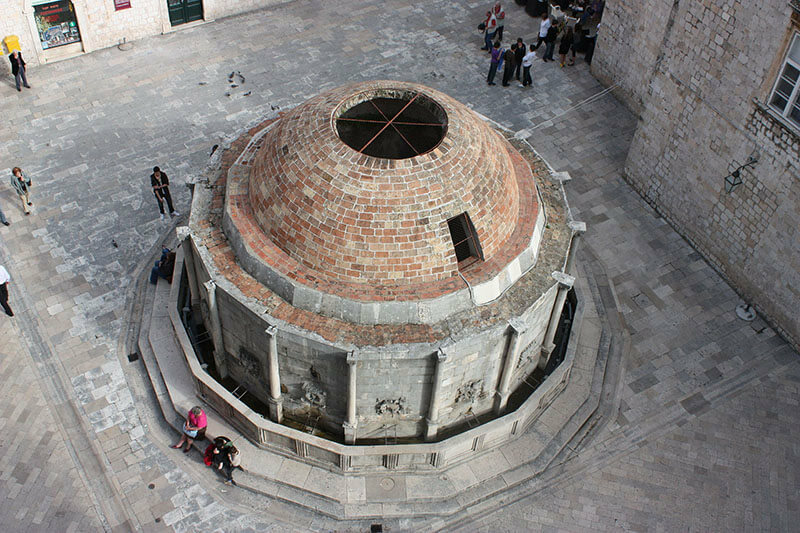 Water in Dubrovnik is pottableGreat council issued a rule in 1436 by which construction of an aqueduct system from Šumet, a place nearby Dubrovnik, started. According documentation, the building of the aqueduct was entrusted to builders Andreucius Bulbito from Tramonte and Onofrio Giordano della Cava. However all subsequent documents mention only Onofrio della Cava as the architect and builder while no one knows what was the role of Andreucius in the project. Dubrovnik water supply still comes from the same spring, the one in Šumet, and is perfectly potable with quality topping the one of the bottled water. 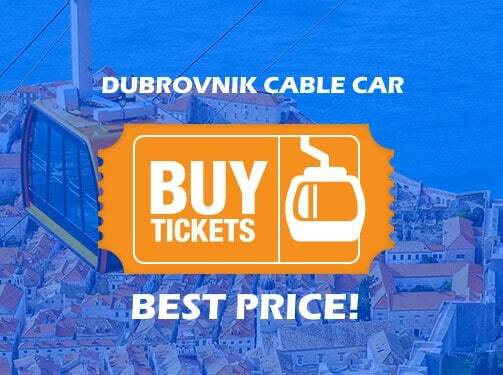 The complex aqueduct system brought water to Dubrovnik by free fall from 106 meters altitude (above sea level) and over 11.7 kilometres (7.3 miles) distance with 4 water tanks along the way which were disused with time as the Republic feared they could be used by the enemy in the time of war. The aqueduct contract included the section which stipulated that the architects compensation would be penalized for every drop of water lost along the aqueducts way. Interesting to note the final result was flawless hence no penalty applied to the compensation. Big Onofrio Fountain in DubrovnikAfter the Aqueduct system, Onofrio della Cava builds two fountains, now known as the Big Onofrio’s fountain on Poljana Paskoja Milicevica (Croatian “Poljana” = plane, square), in front of the St. Savior church, and the Small Onofrio’s fountain under the Bell tower next to the building of the City guard. Maskeron detail ­ Big Onofrios fountainBuilt from 1438 to 1440, the Big Onofrio’s Fountain is a sixteen­sided container with a cupola, and was one of the ending points of the aqueduct system. Each of the sixteen sides has a unique “maskeron” design (stone­carved masked face) with the faucet projecting out of the mouth of the each design. Unfortunately the maskerons have been damaged during one of the recent repairs done to the fountain. 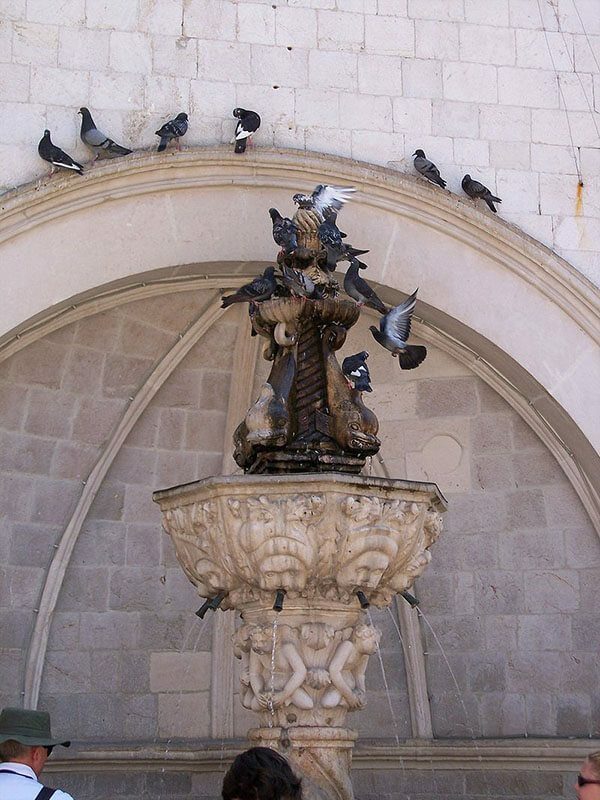 The fountain’s cupola was made by Petar Martinov from Milan. However, the fountain was also partly damaged by the earthquake in 1667 hence the current look is missing a dragon statue that had once been on top of the cupola. 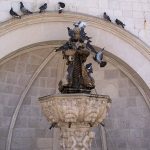 Small Onofrios Fountain in DubrovnikNext to the building of the City Guard on Luza square, under the Belfry, the Small Onofrio’s fountain found its place. The purpose of the Small fountain was to supply the market on the Luza square with water. Sculpting work on the fountain was made by sculptor Petar Martinov from Milano, while the mechanism was the work of Onofrio della Cava. 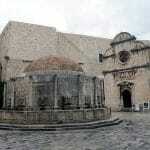 The fountain was built in the period from 1440 to 1442. 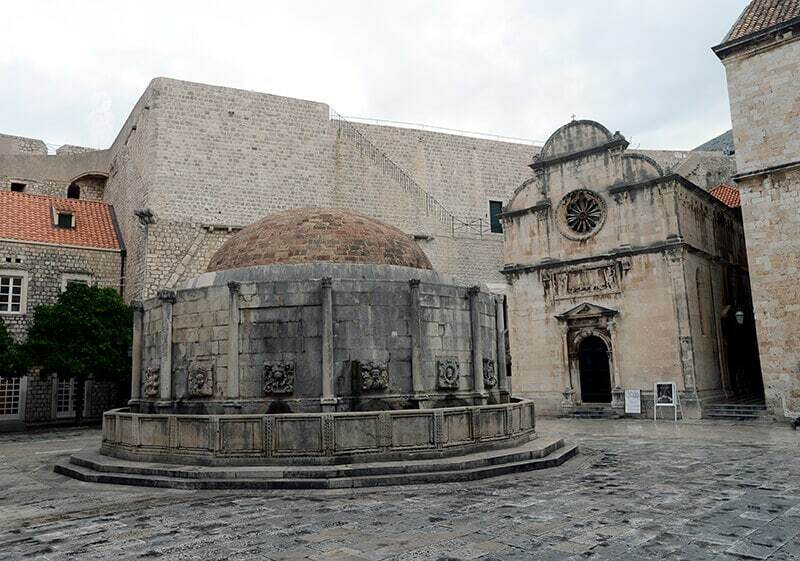 Same time as the Small fountain was erected the water was also passed also to the Rector’s palace and the fountain that supplied water to the building for hundreds of years can still be found in the atrium of the Rector’s Palace. Somewhat later water was passed also to the Tabor (on Ploče), once a market place and meeting place of Turkish caravans. The water was used for the Lazaret (Quarantine building) and Turkish hans (Turkish inns with tavern). In the 16th century we find the first mention of another fountain inside the City walls, the so called Jewish fountain, named so as it was exclusively used by the Jewish community. 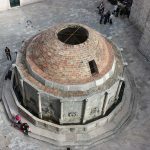 The Jewish fountain used to be under the Bell Tower, and after the fall of Republic it was transferred to Brsalje where it stands today and is used for refreshment of many by­passers.